Last February, I shared a blog about the Leander Independent School District in Texas where staff have focused their professional development, PLCs, and classroom observations around seven critical student behaviors. Learning Objective: Students articulate the learning objective/target and find meaning in their learning. Assessment for Learning: Students assess their progress toward achieving the current learning objective/target. Plan for Intervention/Challenge: Students utilize classroom processes created for intervention and/or challenge. High–Yield Strategies: Students understand and use a variety of learning strategies and tools to help them learn. Student Collaboration & Learner Engagement: Students are interacting and engaged in their learning. Data Analysis & Goal Setting: Students set learning goals and track their progress on an ongoing basis. Assessment of Learning: Students produce evidence of their learning aligned with the learning objective/target. This summer I returned to Leander to spend a day with the leadership teams from each school. These teacher and administrator teams worked to forge a plan for the coming year, selecting a few of the behaviors that they thought most critical to advancing their continuous improvement of student achievement. Teams then identified what these behaviors looked like and sounded like on a continuum from initial stages to increasing complex levels. How should complexity of student self-assessment and goal setting grow in grade three from beginning to end of the year? How would it be expected to develop from grades 3 to 4 to 5? What would we expect at the start of middle school? What would student engagement look like as grade 9 students take increasing responsibility for learning across the year? How would we want that to change as high school students move into grade 12 and onto graduation? These continuums provide an initial measure of ”where we are” and “what the next steps” might be. 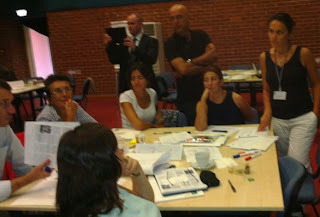 Last year while conducting an Instructional Coaching seminar in Istanbul, I met with a leadership team from Okullan, a private preK-12 school. Plans were set for me to work with teachers this August and with school leadership throughout the year. In preparation for my visit, the Hisar team informed me that they wanted to begin working with Learning Walks, focused first on administrators and then teachers observing student behaviors to identify ways to increase student success. The email they sent had an article attached that described an existing program they thought could provide a starting point. I opened the attachment and found the article written by Bret Champion, the Leander ISD superintendent, listing the seven student behaviors. The Hisar team had no idea I had been working with the Leander district. So the Hisar team is now building their continuums of progress for the same student behaviors. In our initial day of discussion and design we identified the desire for the behaviors to grow in complexity (across the year and from year to year) and for the students’ independent practice of the behaviors to similarly progress. I’m excited to be returning to Leander and Hisar during this year and to continue sharing and learning from their work. 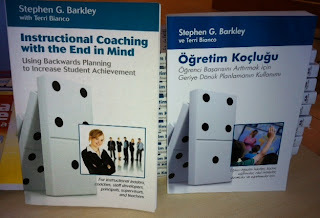 Also, I’m happy to announce that thanks to Lead Turkey, a Turkish company focused on professional development for educators, my book Instructional Coaching is now available in Turkish. It’s a smaller world.